Every time I make this slice it’s always a hit, and when I recently made it to take over to a friend’s place for afternoon tea, it lasted a whole 5 minutes before it was quickly demolished with all of us wishing we could have more. Because there is just so much sweet goodness in this slice, it’s important to make sure that the tin you are using is deep enough to accommodate it all. I like to use a 20cm x 20cm cake tin which has sides approximately 8cm high (which gives me plenty of room), however, you can also use a 28cm x 18cm slice tin if you prefer. While there is no doubt that this slice looks super impressive, it’s also really simple to make (I promise!) and the hardest part is trying not to eat all of the Tim Tams before putting them into the slice! Line a 20cm x 20cm square baking tin (which has high sides) with baking paper. Make sure you leave plenty hanging over the edges to help you remove the Tim Tam hedgehog slice once it has set. Roughly chop 6 of the Tim Tams into large pieces and set aside until needed. Place the plain biscuits into a food processor and blitz until they have just broken up. Add the remaining whole Tim Tams (approximately 1 ½ packs) and blitz for 5 seconds or until they have broken into large chunks. Place the crushed biscuits into a large bowl and set aside. Pour the condensed milk into a small saucepan and add the butter and cocoa. Cook over a low heat, stirring occasionally, until the butter has melted and the ingredients have combined. Pour the condensed milk mixture into the bowl with the crushed biscuits and add the coconut. Working quickly, use a large metal spoon to mix the ingredients together. Pour the mixture into your prepared tin and flatten the surface with the back of a spoon. 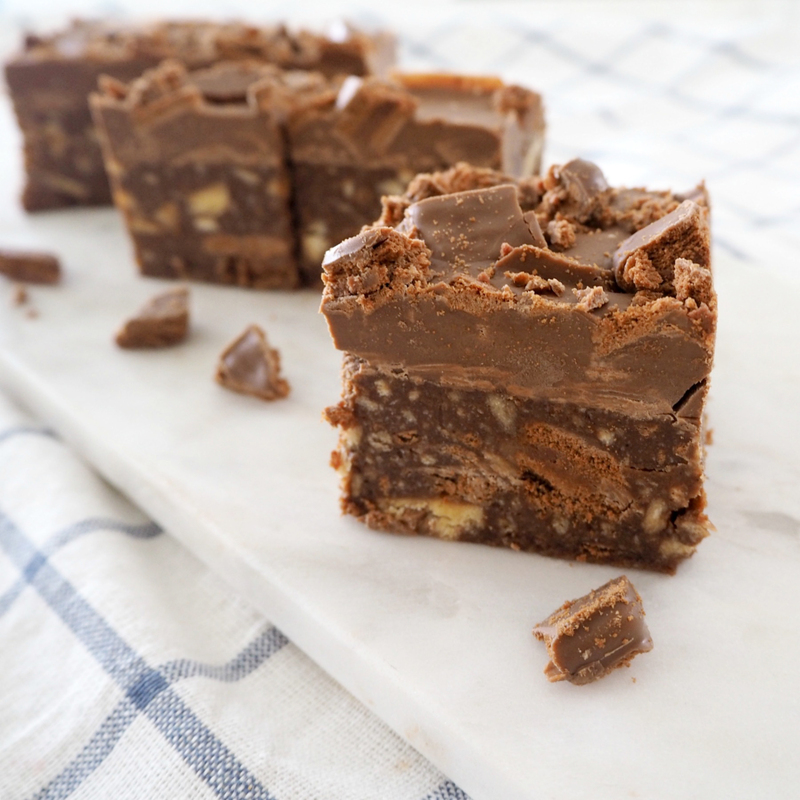 Break the milk chocolate into squares and place it into a microwave-safe bowl. Cook in the microwave on high for 30 second spurts (mixing in between), until it&apos;s just melted. Pour over the top of the slice and sprinkle the Tim Tams you set aside earlier over the top. Place the slice into the fridge for 6 hours (preferably overnight) to set. Once set, remove the slice from the tin and cut into pieces. Instead of using a food processor to crush the plain biscuits and Tim Tams, you can also just use a rolling pin to break them up.